Alexander, a resident of Wantagh, undertook a project to re-establish the art program at the Theresa Academy of Performing Arts, a school for special needs children in Long Beach, which was destroyed by Hurricane Sandy. Alexander worked closely with the school’s director and art teacher to come up with a list of supplies in order to replenish their art program when they re-opened. He, along with the help of his troop, held a fundraising night at a local Wendy’s as well as collected donations of supplies at his former elementary school, Forest Lake in Wantagh. Along with the fundraising night, Alexander collected bottles and cans and redeemed them, using the money he raised to purchase further supplies. Alexander’s brother, Aidan, attended workshops at the Academy prior to it being devastated by Hurricane Sandy giving him the idea to re-establish the program for his project. 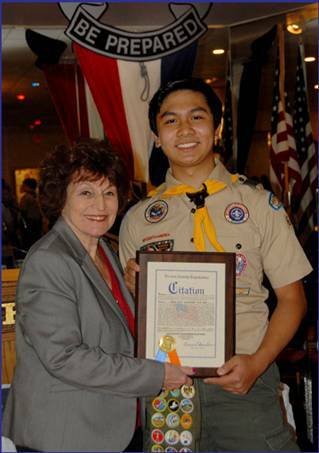 Pictured (l-r): Presiding Officer Norma Gonsalves and Eagle Scout Alexander Colin Adia.